Hello, we are Dadan The Theatre Company . Of course, we do the play. What do you imagine from the word “the play”? A grand stage, or showy stage lightings? Well,we’ll change your stereotype! Our stage is classroom No.331.It is neither a big hall nor a playhouse which has rich equipments. “The classroom”, a familiar place for you, turns to our stage for the play ! We will perform on the unconventional stage for free XD. 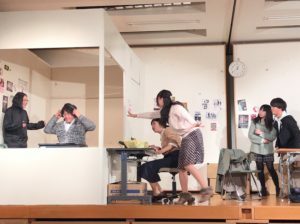 “GOGEKI” is interesting, but how about coming and seeing our play in Japanese?